After a long wait (sorry about that) Ultimate Mod 5 is now up and running and working as intended after the Beta, and with several important changes. Many thanks to Thunder for making the installer! -The Fed GUI has been overhauled and largely recreated. Initially I was working with a Large galaxy set to 47x35, but I found the going slow and tedious. So I lowered it. Of course those who prefer a gigantic map of possibly even unstable proportions, it's a simple matter to mod UM5 with DCER's UE to dimensions of your liking. My testing has also only taken Irregular Galaxies into account, which is all I have ever played. So for those who run with Ring Galaxies or Spirals or whatever, some customization or tinkering on your part might be necessary to reach your preferred configurations. Their current settings are as default in accordance with this chart. The importance - and rarity - of M-class worlds was always underplayed in Botf. No longer. Most planet types have had their populations significantly reduced (eg large Arctic: 40-50, small Barren: 5). 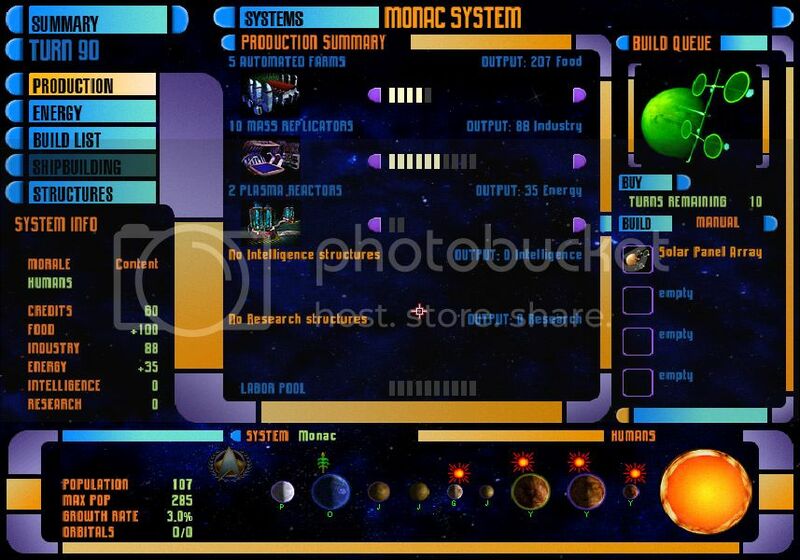 M-class becomes an important resource in securing a decent sized system, and to enhance your empire. A single high bonus Large M-class can net you 300+ in population. On the whole, system pops are a little larger than vanilla botf, but those M-class systems play a big role. You will need them! By all means go to war over them when they crop up! There are a few new models I've created for UM5 - one for each empire (except Dominion). There are a number of other, older ship models that I've made for earlier mods, making a return here, like my old Constitution and Excelsior. Ofc various other models that are non-vanilla, made by various people over the years – notably Siggi who provides the Dominion ships. Shiplist currently stands at 172 ships, with approximately 30 to each empire. I've done something different with this shiplist. In previous mods I've crammed as many ship models in as possible, especially for the Fedz, for whom we have many canon classes and designs. They seemed to have 1 or more new ship class each tech, which just wouldn’t do. Ultimately, I found the shiplist ugly, eclectic, and prone to cause headaches if looked at too long. The end-game fleet was a horrible clutter of so many pointless classes for the way this game works. I didn't need to have 4 or even 5 different classes of cruiser for example. So UM5 consolidates heavily, and makes order out of chaos, and it is largely in thanks to Gowron who produced a similar list with his Balance of Power mod. So, sorry fans of the Steamrunner, Sabre, Curry etc etc, or even the Intrepid-class - they won't be in UM5. They just don't 'fit in' when one end-game cruiser type (not including Heavy cruisers) is enough imo. Every empire follows more or less the same formula from tech 1 to end game. 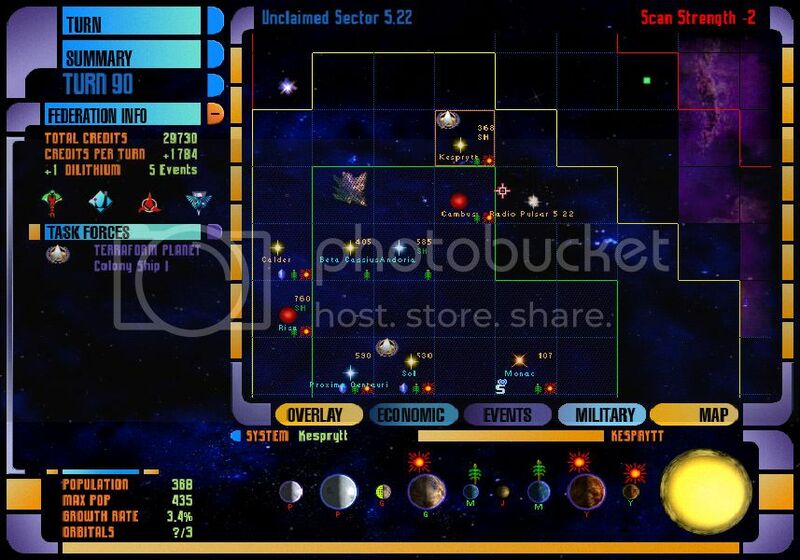 4 Starbases, 4 cruisers, 4 commands, 3 scouts, 3 strikes, 4 destroyer types (plus 2 Colonies and 3 TTs). Some empires have plain Destroyers, but get Heavy Cruisers, others get plain Cruisers, but have Heavy Destroyers. 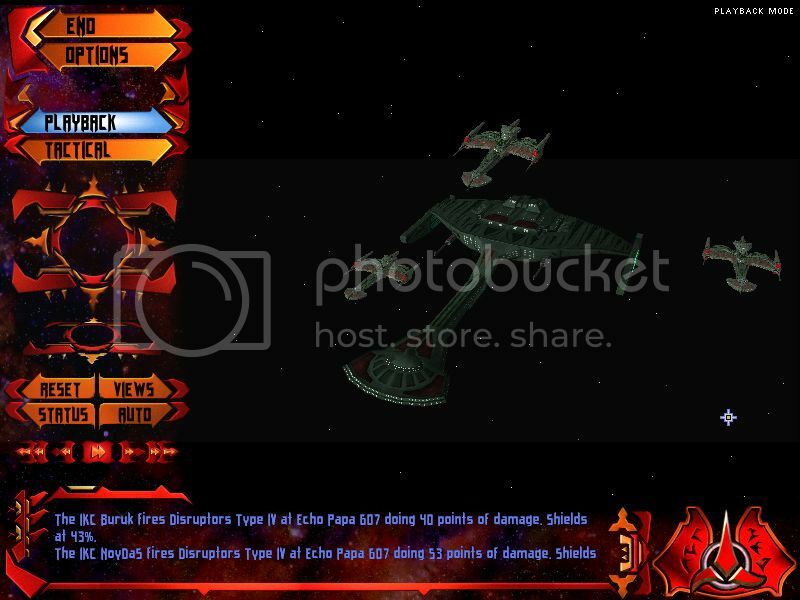 But each empire gets a big, powerful end game ship - the pinnacle Command Ship, available at Tech 12. The Federation get my new Cosmos-class Explorer, the Cards the Ranor-class (aka Hutet), the Klingons the Negh'var type IV, the Romulans Valdore-class Warhawk. I like to hold to canon wherever possible. UM5 makes use of several new and interesting output types made available with recent modding breakthroughs. Namely, Scientific and Military Intel, Industry EW, and %Raiding. Here's a preview. The Romulans, always sneaking around trying to catch the word on the technological progress of their rivals (USS Prometheus anyone?) get %Scientific Intel in their new Naval Intelligence structure (Tech 8 - these powerful buildings are all late-game buildings), separate from the Tal Shiar. After the Dominion war on DS9 the new Cardassian provisional government installed the Intelligence Bureau to replace the defunct Obsidian Order. So the Cards have the Intelligence Bureau for %Military Intel. The Klingons have the Deep Space Gulag, a grim, icy prison planet (a OPE structure). It yields a powerful Empire-wide Industry boost. Lastly, for whoever can get them, the Orion Marines Guild provide their strategic expertise to grant a %raid bonus to raiding deployments empire wide. And there are many, many other cool new structures. The Zakdorn even get their Surplus Depot as seen in TNG (as well as their usual Military Academy ofc). This mod would not have happened were it not for the very kind assistance of Thunderchero first and foremost with helping me come to terms with many of the new fixes now available, and numerous other topics which I struggled to get to grips with as I slowly got back into modding again. 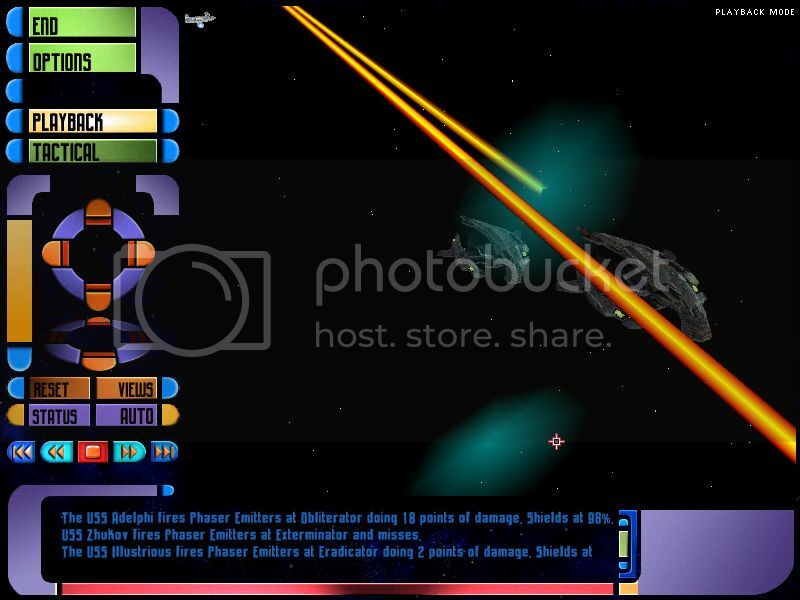 Additional big thanks must also go to DCER, Gowron, Flocke, spocks-cuddly-tribble, Quasardonkey, Joker, Peter1981, and others I'm certain (i'm sorry if I've forgotten to list them all) for their hard work, research, and tremendous insight into improving this game! UM5 has been generally augmented, and patched with some 70+ patches and fixes with QD's Botf Patcher tool; plus the Error Correction Mod patches, and comes with the Energy screen project enhancement. Also included are a few of my own custom-written patches (based on others research/solutions), including: territorial claim expanded for both inhabited systems and starbases; no more base structure micromanagement and upgrades - upgrade is automatic with Tech increase; max 9 planets to a system (Gas giants disabled); credit output adjustments, Tech levels increased to 12 (technically 13: Tech 0-12); the required population for Trade routes slightly increased. Also I made some habit.bin alterations to fix vanilla bugs (ie Cardassians not liking desert planets, yeh go figure) and provide for the Dominion in place of Ferengi. There's probably other stuff I forgot, but that's it in a nutshell. Many thanks to the research and hard work of DCER, Gowron, Flocke, spocks-cuddly-tribble, Quasardonkey, Thunderchero, Joker, Peter1981 and others. Plus various other custom amendments/patches of my own. 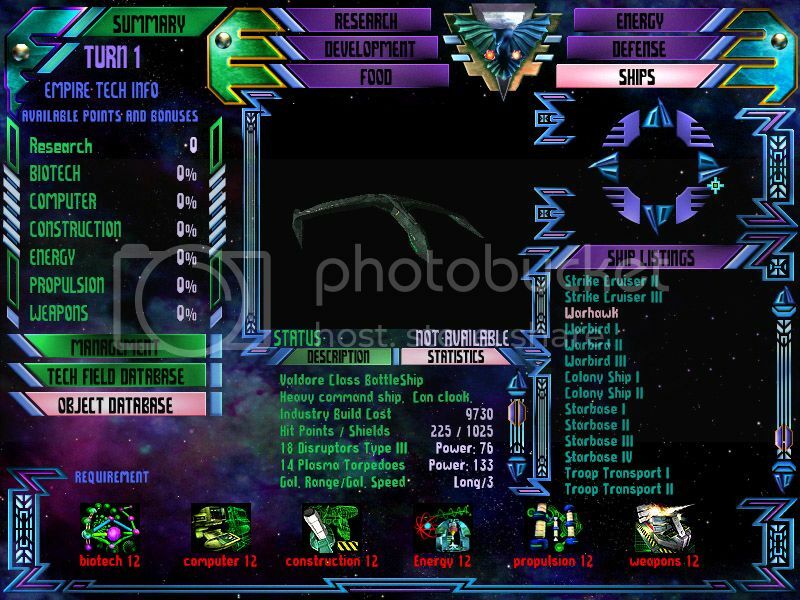 type II versions of the same ship that are initially available at tech 10.
that grant +morale; an end-game empire-wide ground combat structure for each empire. 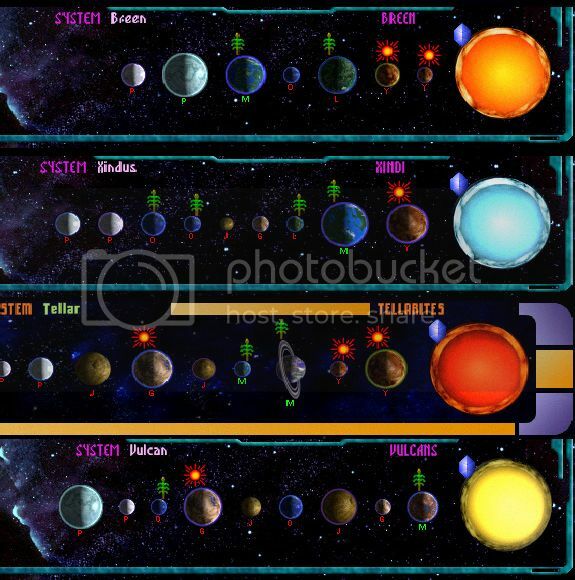 them access to energy structures associated with certain planet types. -Eliminated several cosmetic errors and typos. neat trick to slightly increase ship to ship initial distances in tactical combat. what is applied by the tech level. you want everything handed to you on a plate? Sometimes ctd at galaxy generation due to preset minor race frequency. Just watch race intro vid for a few secs and galaxy should load. require further tweaking for those who prefer these shapes. at galactic generation, with "readrace.c, Line: 257, 0" error. Players may however find slightly less than the 29 minors on all Large Irregular galactic maps. animations (and apparently their growth rates too), and it is an issue that has no solution at present. not being be the right size. text> voice program to create much superior sound clips). Note: whereas some of the models and textures are my own, many of the ship models used in UM5 are indeed from vanilla, but have been retextured/reconditioned. Many thanks to Vjeko and Zeleni for use of some of their artwork from Supremacy. Again, massive thanks to Thunderchero for helping me get this mod off the ground, and for solving many bugs and answering my numerous PMs. And never forget DCER and Gowron. Without their hard work and effort, and great intelligence, this mod – and I believe many mods – would just NOT be possible. You know the score. 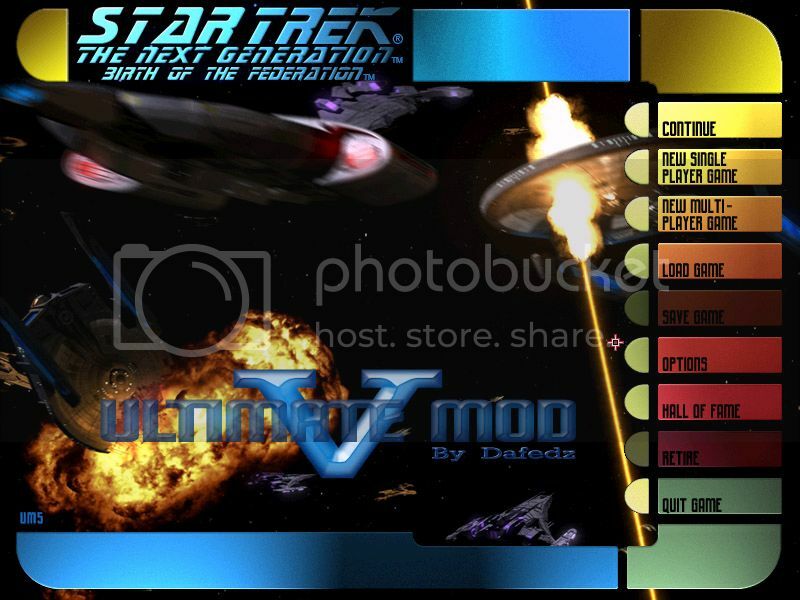 Ultimate Mod 5, a modification of “Star Trek The Next Generation: Birth of the Federation” (being the intellectual property of Microprose and Atari Inc., based on Star Trek™, being the intellectual property of Paramount Pictures) is released into the public domain for free, for purposes of non-commercial usage, and does not seek to infringe upon the rights, royalties or copyright of any commercial parties. You are the End User, and you agree to these terms, and you agree to the usage of the Ultimate Mod 5 material at you own risk. You also agree that the author and distributor of this mod is Dafedz, in association with listed contributors, and you agree NOT to use or distribute any of the material in Ultimate Mod 5 without express permission from that author or the listed contributors. These are the terms of usage, and your agreement to liabilities, and you agree to them to the best of your knowledge and ability to understand them in your application and usage of the material. The author of Ultimate Mod 5, Dafedz, and any of his contributors, shall not be liable for any infringements you make, or any damages this material causes. Last edited by Dafedz on Wed May 27, 2015 12:00 pm, edited 9 times in total. Re: Ultimate Mod 5 v1, coming soon! Looks freakin' awesome Dafedz. Can't wait to try it out! wow, I'm already stunned by this anouncement, that's awesome! Maybe also do some mp testing ahead to see what needs to be tweaked to balance the mod. looks awesome; a bit different from how i like the economy and ships to be but with UE (almost) everyone can adjust that to their liking. One question though: when you said "coming soon" was that Thunder-like soon (end of the year) or did you mean like in 4 weeks. And if you are bored after you release it, there are a few ships i am sure many would like to see in the mods like the Insignia class and Diligent class; there is a thread about what ships people would like to see in the game. Pleeeease have a look. noooo, don't say that; i only meant that he's like Blizzard; he doesn't release anything unless it meets his high standards. There are three ways a project can go wrong: over budget, late or buggy. Every one can live with and understand the first two; but not the third. So take your time TC, i for one can wait. It is new. 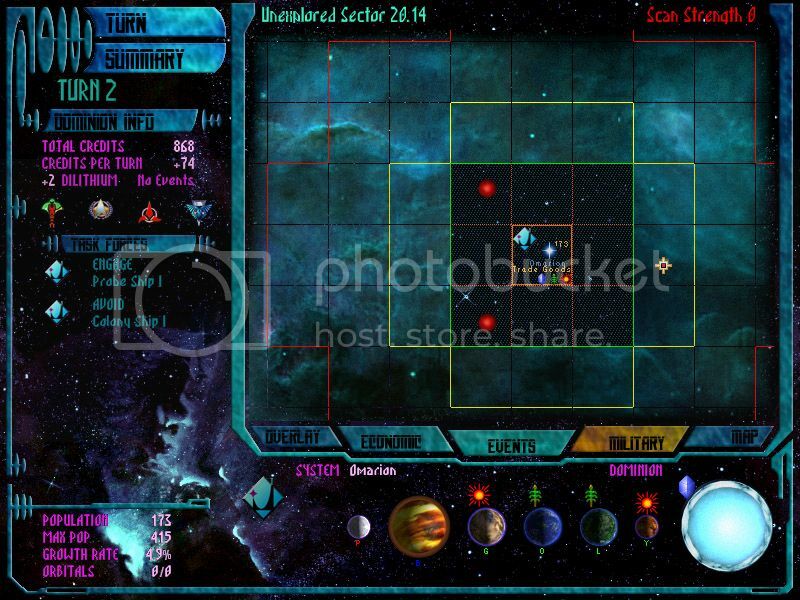 But here you only see the main galactic screen, which is as far as the new design goes for now. The rest of the Dominion's GUI will be as it was in UM4. Flocke wrote: wow, I'm already stunned by this anouncement, that's awesome! Multiplayer? That would be something indeed, maybe when Beta is ready someone would like to try a game with me? 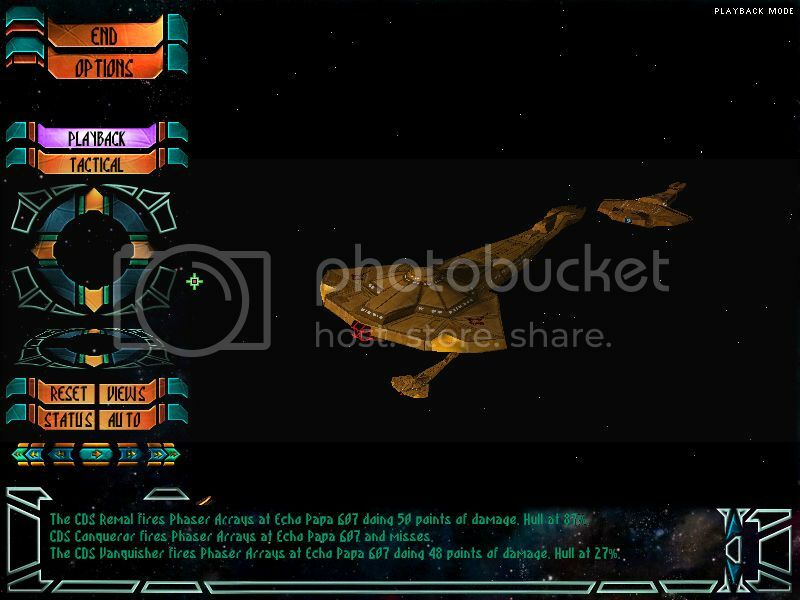 I haven't played a MP game since the old MS Gaming Zone days (like 12 years ago lol) - although on occasion up to about 2004 I played via direct connection with a guy from one of the old Romulan clans. We had some awesome battles. But still, it was years ago now. adi wrote: looks awesome; a bit different from how i like the economy and ships to be but with UE (almost) everyone can adjust that to their liking. How so adi? I'm certainly up for receiving feedback, even at this early stage. How would you prefer the economy work, and the shiplist? adi wrote: One question though: when you said "coming soon" was that Thunder-like soon (end of the year) or did you mean like in 4 weeks. 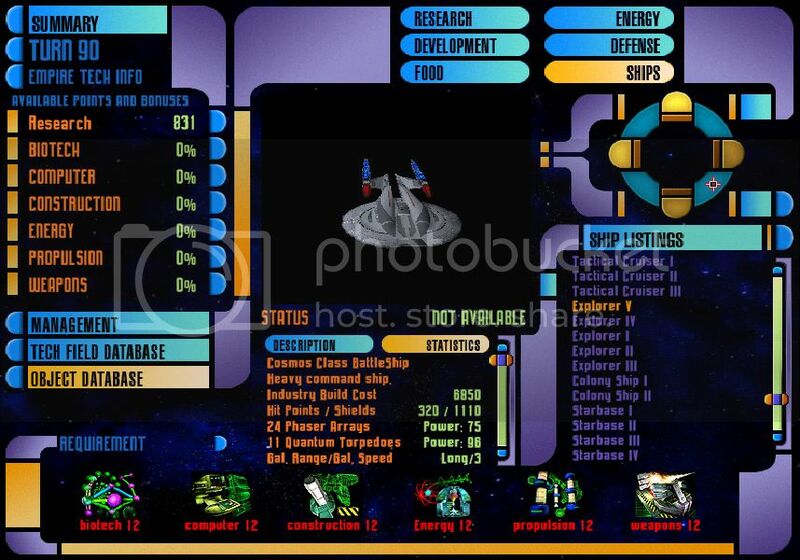 adi wrote: And if you are bored after you release it, there are a few ships i am sure many would like to see in the mods like the Insignia class and Diligent class; there is a thread about what ships people would like to see in the game. Pleeeease have a look. I've seen them. Very cool ships. But I'm circumspect about adding non-canon ships into the Federation list particularly. They have more than enough canon ones to fill it up. Except in this instance with UM5, where there was a call for an Explorer type (a successor to the Sovereign) that canon couldn'tt provide. 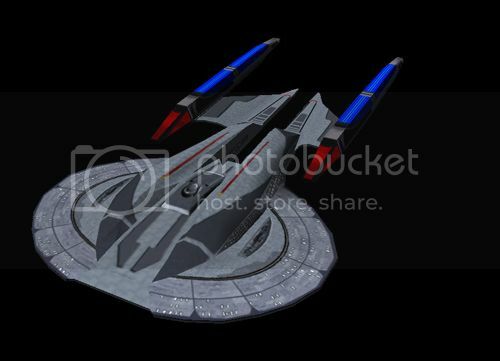 So I opted for my own design, the Cosmos-class which was based in part on my old Cosmos design from about 6/7 years ago: ie this ship, which was a study model I built for a potential new class design I never fully developed. This was a rough study model of how I envisioned it. The UM5 Cosmos is a bit different, but a similar design theme..
adi wrote: There are three ways a project can go wrong: over budget, late or buggy. Every one can live with and understand the first two; but not the third. You're so right! UM4 in particular had a number of bugs, some never even got fully resolved. I will do my utmost to ensure UM5 is bug free on release. Great Work!. I'm looking forward to the beta version. Can not wait. Last edited by Sweethawk on Fri Apr 12, 2013 5:11 pm, edited 2 times in total. well it's just my preference but i like my ships not to be able to blow them self's out of the sky with one salvo; so I prefer one turn fire power to be less then 50% of (hull + shields for the ship); otherwise i will probably play only romulans or klingons ; and i like more population although i see your point of valuing M class planets. That's sweet music to my ears. I've seen them. Very cool ships. But I'm circumspect about adding non-canon ships into the Federation list particularly. I know and you're right; there's no place for them in the current canon mods; but i think we are overdue for a mod that is a bit in the future - kind off Destiny novels time line; we already have Vesta, Achiles, Luna, Titan, your Cosmos class for feds, add Insignia and Diligent, there are a few new ships (as in not seen on tv) in GALM mod for romulans and klingons. I think we are close to a critical mass from where someone could envision a future mod. nice work there !! !, i do really like the new improvementes and coming Ships of course !!! yay, dafeds! I look forward to spraying my chocolate sauce all over the galaxy! Wow. This is fantastic news! Can't wait to play this mod! Looks exciting, bright future for BOTF indeed! As well as the new planet animations in UM5 I thought it would be cool to create unique, customized animations for Minor race planets - their homeworlds, based on canon information and on-screen evidence (there has been some artistic license as well). I've done some 25 new animations (including 20 varieties of M-class) for the Minors (and for the Dominion/Founders homeworld - top image). Here's a preview. There is one anomaly though. Occasionally, in places, some of these minor race planet animations are showing up in other random systems. 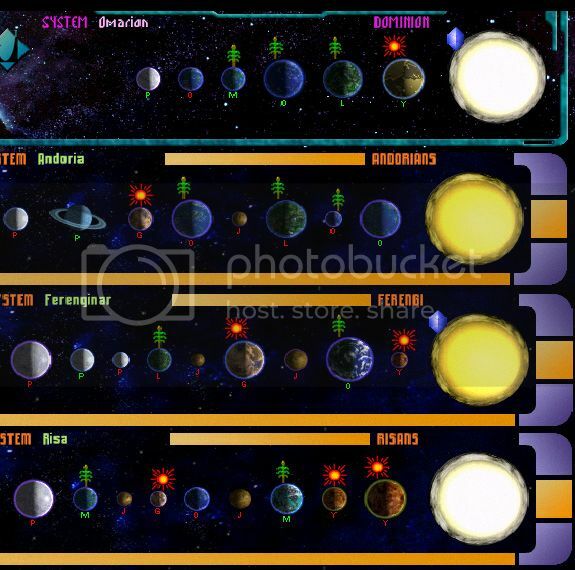 There is an example in the above image, where you see the Breen homeworld is doubling as a regular arctic planet in the Vulcan system. This shouldn't happen. The minor race anims are custom made and custom assigned (names such as: vulc.ani), and are not registered to any other in game planet. The others all retain the default names of trol.ani, vrol.ani etc, and should not be displaying the minor race animations. If anyone has any ideas why this is happening, and how to fix it, let me know. Because i'm outa ideas.